What is Form 2290 ? IRS Form 2290 is for paying federal tax on the first use of a taxable highway motor vehicle on a public highway. The vehicle must be more than 55,000 pound should be registered beginning on July 1, 2018, and ending on June 30, 2019. You should pay for paying 2290 tax within the due dates given below to avoid paying interest and penalties. 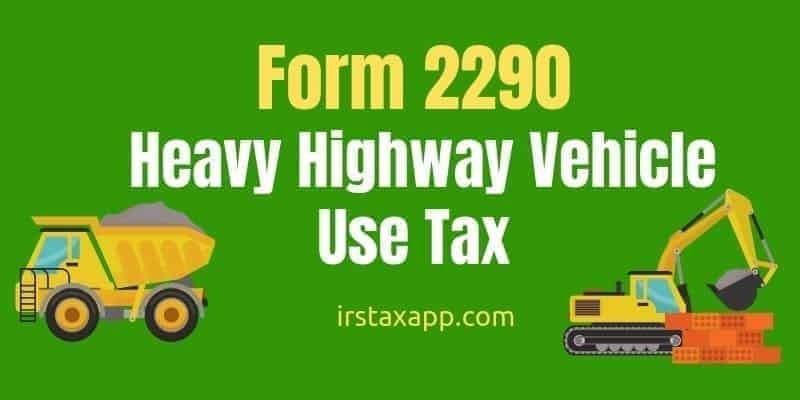 Also important to note that you must keep on mind when is 2290 due and pay tax regardless of when state registron for the vehicle is due. What if I Register Additional Trucks ? In case registered the additional taxable truck in your name, you are liable for the Heavy Highway Vehicle Use Tax (Form 2290), prorated for the months during which it was in service. Due dates should be determined as per above table. Who Must File IRS Form 2290 ? You can use Form 2290 for paying taxes in the following situations. Motor vehicle having a gross weight of 55,000 pounds or more is registered, or required to be registered, during the period beginning on July 1, 2018, and ending on June 30, 2019, in your name under state, District of Columbia, Canadian, or Mexican law. The tax is due on a vehicle for which you completed the suspension statement on another Form 2290 if that vehicle later exceeded the mileage use limit during the period. If during the period, the taxable gross weight of a vehicle increases and the vehicle falls into a new category. To claim suspension from the tax when a vehicle is expected to be used 5,000 miles or less (7,500 miles or less for agricultural vehicles) during the period. To claim a credit for tax paid on vehicles that were destroyed, stolen, sold, or used 5,000 miles or less (7,500 miles or less for agricultural vehicles). To ,eport acquisition of a used taxable vehicle for which the tax has been suspended. To pay the tax due on a used taxable vehicle acquired and used during the period. Where to Mail Form 2290 ? How much is form 2290 penalty ? The form 2290 penalty for failing to file IRS Form 2290 by August 31st is equal to 4.5 per cent of total tax due, assessed on a monthly basis up to five months. If you are late in paying 2290 tax , you may also face an additional monthly penalty equal to 0.5 percent of the total tax due .